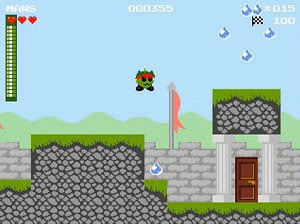 Super Ecksdee Panic is a free action platformer inspired by games such as Super Mario and Kirby. There are 6 different levels to explore with a character that can transform in his friend and use that ability to overcome some obstacles – in a MegaMan fashion. There are also some bosses to defeat along the way.